"Probably about 25 years ago, my Aunt Marie got the recipe from a co-worker and gave it to me. I'm not even sure if she ever made them herself. I started making them for a cookie swap and they kind of became my signature cookie." Well, Roz, my unofficial 5th sister, since this is your signature cookie, you get the credit for the recipe. Thanx so much for sharing! Now, shall we get back to our Ebay shopping? Cream butter and add sugar gradually. Beat until creamy. Add eggs one at a time, add vanilla. Add ricotta cheese and beat for 1 minute. Mix flour, soda and powder in a separate bowl. Add this mixture gradually to wet mixture. Stir well. Drop by teaspoon on ungreased cookie sheet. Bake at 350 degrees for 10 to 12 minutes. Remove from oven. Ice and decorate the cookies while warm. Beat until smooth. 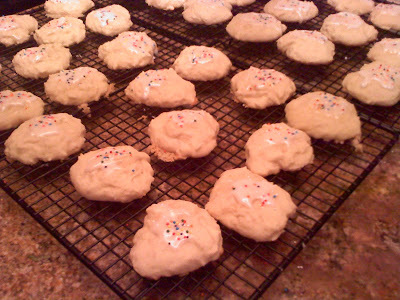 Dip cookie tops and decorate with sprinkles. Cookies will be white on top, light brown on bottom. Do not double.